Randall Franks and Leona Williams visit back stage following their inductions. Randall Franks and Razzy Bailey pause for fans to take photos after the event. 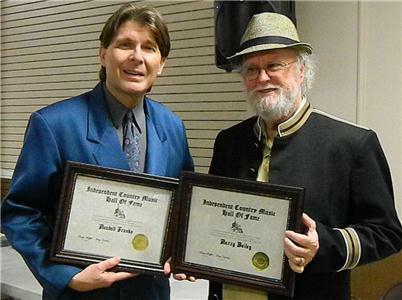 Randall Franks joined Leona Williams, Razzy Bailey and Glenn Douglas Tubb in performing during the Independent Country Music Hall of Fame induction ceremonies. Mr. Franks chose to share his version of the gospel classic "In the Garden" at the awards. 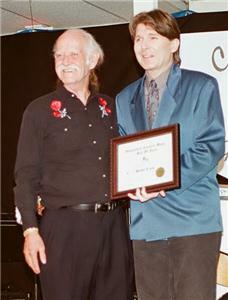 1999 Hall of Fame Inductee Jerry Cramer welcomes Randall Franks into the Independent Country Music Hall of Fame. 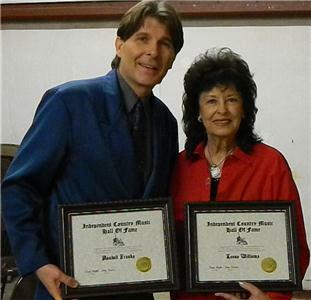 Entertainer and actor Randall Franks of Ringgold joins historic country music luminaries such as A.P. Carter of the Carter Family, Pop Stoneman of the Stoneman Family, Uncle Dave Macon and Fiddlin’ John Carson in the Independent Country Music Hall of Fame. Mr.Franks was inducted alongside several industry friends including Leona Williams, Razzy Bailey, Jean Shepherd, Jimmy C. Newman, the late Billie Jo Spears, Glenn Douglas Tubb, Jerry and Helen Burke, Leslie Elliott, Jim Lusk, Phyllis Cole and the late Johnny Carson. Mr. Franks accepted the induction on behalf of those who he said invested in his life and encouraged him along his path. Hall of Fame member Jerry Cramer presented Mr. Franks the award as he also expressed his appreciation to the nominating committee for his induction. “It is especially such an honor to join such an illustrious class of inductees filled with so many whose work I have admired through my career as well as many who are my friends,” he said. Mr. Franks is best known as “Officer Randy Goode” from TV’s “In the Heat of the Night,” a role he performed on NBC and CBS from 1988-1993. He also starred with Robert Townsend in his series “Musical Theater of Hope” which aired on GMC-TV in 2009. He has co-starred or starred in 14 films with superstars including Dolly Parton, Christian Slater, William Hurt and Stella Parton and legendary western star “Doc” Tommy Scott. His most recent film is “Lukewarm” with John Schneider, Nicole Gale Anderson and Bill Cobbs. Mr. Franks’ musical stylings have been heard in 150 countries and by more than 25 million Americans. His musical career boasts 19 album releases, 17 singles, and over 200 recordings with various artists from various genres. One of his most popular self-penned Songs of the Year award winners is “The Old Black Fiddle.” The award-winning fiddler’s best selling release, "Handshakes and Smiles" was a top 20 Christian music seller. Many of his albums were among the top 30-bluegrass recordings of their release year. The Atlanta Country Music Hall of Fame member shared a top country vocal collaboration with Grand Ole Opry stars the Whites. In addition to his solo career that includes 13 years guest starring for Grand Ole Opry, Franks is a former member of Bill Monroe's Blue Grass Boys, Jim and Jesse's Virginia Boys and has performed with Jeff and Sheri Easter, the Lewis Family, the Marksmen Quartet, Elaine and Shorty, “Doc” Tommy Scott’s Last Real Old Time Medicine Show and Doodle and the Golden River Grass. He is president of the Share America Foundation, Inc. that provides the Pearl and Floyd Franks Scholarship to musicians continuing the traditional music of Appalachia. 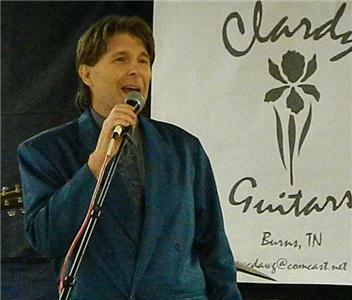 He hosts a monthly concert series at the historic Ringgold Depot which helps fund the scholarships. He authored four books including “A Mountain Pearl: Appalachian Reminiscing and Recipes;” “Stirring Up Success with a Southern Flavor” and “Stirring Up Additional Success with a Southern Flavor” with Shirley Smith; and “Snake Oil, Superstars and Me” with “Doc” Tommy Scott and Shirley Swiesz. The award-winning journalist is a syndicated columnist with his “Southern Style” appearing weekly in newspapers from North Carolina to Texas and at http://randallfranks.com/. Also honored at the ceremonies near Nashville in Lebanon, Tn., were Roy August, T. Jae Christian, Gary Clardy, Ed Gowens, Hickory Wind Band, Marty Martel, Dave Lindsey, Gary S. Paxton, Ernie Rowell, Bill Rainey, Donna Ray, and Steven B. Riley. The Independent Country Music Hall of Fame Awards was established in 1996 to recognize those independent recording artists, songwriters, producers and country music industry business people who deserve recognition for their important roles within the country music family. For more information, visit http://www.independentcountrymusichalloffame.com.